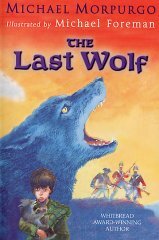 This may only be a short story, but Michael Morpurgo packs a lot of action into it. Robbie McLeod has the misfortune to be orphaned at a very young age and is brought up for a while by his heartless uncle. He is also born into a difficult age, being young and idealistic, in Scotland, at the time of the Jacobite Uprising in 1745. That's when Bonnie Prince Charlie came back to Scotland out of exile in France, to claim the throne which was rightfully his. The charismatic Prince swept through Scotland calling men to arms as he went, and Robbie joined them. Robbie was there at Culloden, when the Scots were overwhelmed by the English, and Robbie ran for his life from the field of battle. And he became a hunted man. Except he was still no more than a boy of sixteen. The English redcoats hunted the Scots mercilessly. Robbie hid in a distant and remote glen, and it was there that he made the best friend of his life, Charlie. Now, not everyone would be able to make a friend from a wild wolf, but Robbie did. And if you want to know how he did it, you will have to read the book. He grew quickly from a pup into a young wolf, and as he did so came to know me and to love me, perceiving me now as his provider and his friend, so that he would follow me wherever I went, his nose touching the back of my leg as if to remind me constantly of his presence, of his reliance upon me, of his affection for me. In my turn, I came to look upon Charlie as my only friend in a world full of enemies. I had no other. Wolf and rebel, we were inseparably bound together by the very nature of our common plight. And if you want to know how Robbie and Charlie, together, outwitted the English redcoats and made it safely across the Atlantic Ocean to the great free land that is America, you will have to read the book. A beautifully told story, in Michael Morpurgo's unmistakeable, quiet voice.